How to Clean and Polish Solid Surface Countertop? Home / How to Clean and Polish Solid Surface Countertop? Cleanliness is an utmost concern amongst everyone who is desirous of having a speck or span home or office. A sparklingly clean room can make a powerful impression on people. The light radiating confidently from the surfaces of the polished surfaces inculcates smartness and confidence. But, keeping a solid surface in that ideally high polished and sparkling state, is not an easy job. It requires careful handling, the proper and efficient use of cleaning and polishing materials, proper maintenance to name a few. It is therefore, good to have as much knowledge and know as many tips on cleaning and polishing a solid surface as possible. 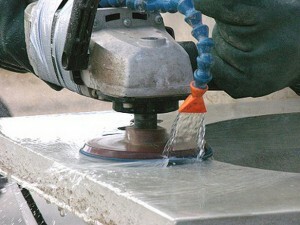 There are many tips and tricks for polishing a solid surface well. 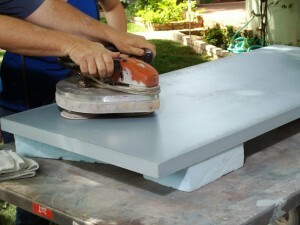 In case a solid surface gets stained, it should be washed thoroughly. Using simply, a sponge along with some water mixed with soap acts as a good cleaning agent for the majority of stains. There are certain cleaning agents whose use should be better avoided since they might harm the surface. If the stains refuse to go away with simple soap and water, using a combination of soft scrub and a scotch brite might be a good way of making it go. The process of scrubbing has also to be paid some attention; preferably a circular motion should be followed in the cleaning process. The solid surfaces, although they are well adept at handling heat, might be harmed when they come in close proximity with certain devices and components. They should be protected against carefully. While placing hot appliances on the surface, it is preferable to place a stand with rubberised feet on which to rest it so that the heat does not harm the surface. One might try to spray a cleaning liquid of calcium or lime in order to remove rust stains from the table. After the stains are removed the liquid can be removed by wiping it with a soft and dry piece of cloth. For surfaces that are made of stone completely, a stronger cleaning liquid can be used. It is usually left at the surface for a period of two or more minutes for taking effect before being wiped away with a piece of soft cloth. After all the cleaning processes have been completed, all the different cleaning processes have exercised; the final process is polishing the surface so that the surface remains glossy and has a sparkling effect. To maintain the gloss effect a sanding sponge, preferably four thousand grit can be used to arrest the high glossy effect upon the countertop. Following these steps shall help one keep a sparkling clean solid surface and make a solid impression on the minds of the beholders.